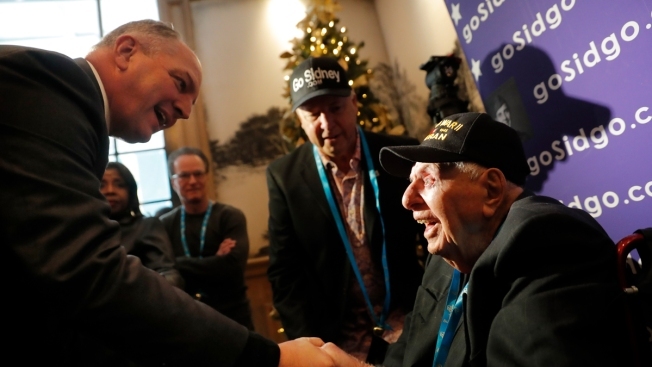 Sidney Walton, a 99-year-old WWII Army veteran, is greeted by Louisiana Gov. John Bel Edwards at Commander's Palace Restaurant in New Orleans, on Dec. 11, 2018. The elderly veteran is on a mission to travel to all 50 states as part of an effort to raise awareness about the dwindling number of veterans from that war who are still alive. A World War II veteran is on a mission to travel to all 50 states as part of an effort to raise awareness about the dwindling number of veterans from that war who are still alive. Sidney Walton, of San Diego, met Tuesday with Louisiana Gov. John Bel Edwards at the Commander’s Palace restaurant. The 99-year-old Walton started his tour in March. As he visits each state, he’s been meeting with governors — 17 so far — and regular people. 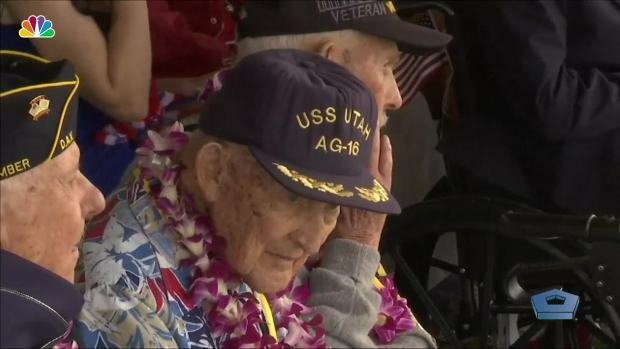 His son, Paul, who is traveling with him, says his dad always regretted missing an opportunity when he was younger to meet a group of the last surviving Civil War veterans. Walton will turn 100 on Feb. 11 and plans to visit the White House that day.